Vineyard Sv. Roko is located near the base of the scenic Pelješac peninsula, just north of the point where it becomes the mainland. This region is called Komarna, known for winegrowing since the Middle Ages. The mystical, southwest slopes of St. Roko are extremely steep, extremely difficult to cultivate, and extremely full of limestone which protects the vine from drought. To survive, the vine has to grow deep under a protective layer to find the fertile red soil. Exposed to the sun and wind, the vineyards offer spectacular views of the bay, the sea and the Pelješac peninsula. These are extreme conditions for making wine, where no one has made it before. 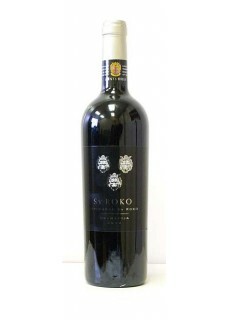 This full bodied, dry wine of a clear ruby red color with purple nuances, is very often referd to as “The Sun’s Child”. The nose is full of rich fruity aromas of blueberry, blackberry and plum, followed by aromas of mediterranean spice such as mint and basil, and some oregano. The texture is complex, layered with fine aromas of vanilla and dark chocolate, plums and figs,as well as some earthy elements. The finish is long, with notes of berry fruit and black pepper. It is differed by very fine minerallity and freshness. Food pairing: Osso-bucco, roasted pork.